No ma'am not Eastern US. Gee, that'll be a difficult one. ?? Hans - what's the difference? Just thinking that myself, Lily - unless the difference is something akin to the Mediterranian or Red Sea etc as opposed to the Pacific, Atlantic etc Oceans. Not sure if that is what Hans meant or not but that would be how I view it. (Excuse the typos, I'm writing this down rather quickly). Could it be a large lake? is it one of the great lakes separating USA and Canada? Close to the Rockies? Well it's one of only 2 that I can remember in the US. Yes to Jube... close to the Rocky mtns. We had a minor discussion on this one as to where it is. No to Hans, No to Semantre and sorry Jube, not the Canadian Rockies. No to AnnMarie because yes indeed Semantre is correct. 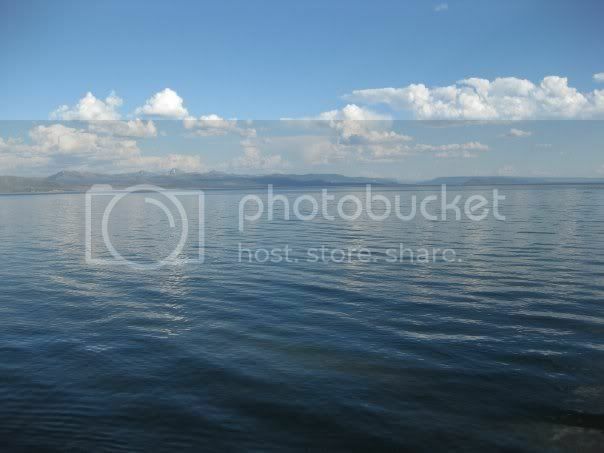 It is Yellowstone Lake. It's a pretty lake. ^.^ Favorite summer vacation spot. Well done Semantre You certainly beat all of us to it.